There must be something in the water the Rajasthan Royals players are drinking. How else to explain the surprising success of their conveyor belt of under-rated or even unheard of players? The latest exhibit of the Royals way is Pravin Tambe, who merely took a hat-trick against Kolkata Knight Riders to steal the game and the Purple Cap for most wickets from Sunil Narine. For those who tuned in late, he also happens to be 42-years-old and was plucked from club-cricket obscurity in Mumbai to play for Rajasthan last season. You’d expect the best players in the world to have figured Tambe out this season but he has been even better. He has a strike-rate of 14, an economy rate of 6.35 and an average of 14.83. By any recognised logic he should not, could not, be doing this. Nor should Rajasthan, currently third in the points table at the half-way stage, trailing only Chennai Super Kings and Kings XI Punjab, be able to challenge for the playoffs year-after-year. That Tambe continues to shine, and Royals continue to contend, can be put down to Rajasthan’s excellent record of spotting talent, new and old, that other’s have missed. Royals cannot compete rupee for rupee with the bigger, more financially powerful franchises. They cannot afford to give Glenn Maxwell a million dollars to sit on the bench. So they hunt for bargains and do it better than any other team in the league. The list of players who have shot to prominence with Royals is a fairly long one. There were Ravindra Jadeja and Yusuf Pathan in the first few seasons. It was their IPL success with Rajasthan that led to selection for India. Yusuf even has a World Cup winning medal as a result. 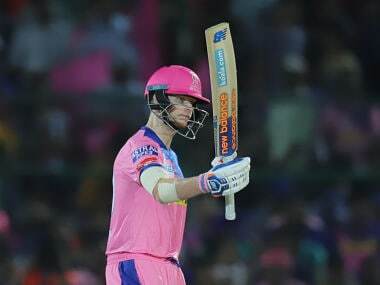 Over the last few seasons, it has been the likes of Sanju Samson, Tambe, Brad Hodge, Brad Hogg and Kevon Cooper who have taken on the baton and kept Rajasthan in the IPL conversation every year. Even the now-disgraced Ajit Chandila was a find back in 2012, and was an important part of their bowling attack in 2013. This season has also turned up Karun Nair, a 22-year-old who has played just 7 first-class matches for Karnataka. 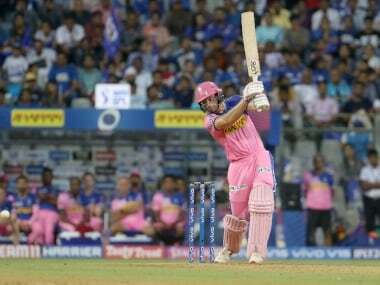 It was Nair’s blistering 73 from 50 balls that led Royals to victory over Delhi Daredevils in their sixth game of the season and he followed that up with a cultured 44 against Kolkata. One of the key factors in Rajasthan’s approach is their disregard for age. You can be 18 or you can be 40. If the team thinks you can do the job for them, you get a shot. Jadeja was a teenage star back in 2008 like Samson is a teenage star today. Tambe isn’t the only bowler in his 40s to turn his arm over for the franchise either. Former Australia international Hogg might have significantly more impressive credentials than Tambe, but it wasn’t like other franchises were queuing up at his door begging him to sign on the dotted line. All of which makes Rajasthan a true meritocracy because they can’t afford not to be. They have to take risks where other teams might be more cautious or more inclined to play a big name over an unknown. There has also been a concerted effort to create a family-like atmosphere in the dressing room, so everyone pulls for everyone else, whether they are playing or not. Rajasthan are not a team of stars; they are simply a team. 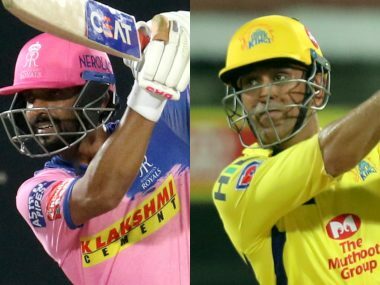 This approach has allowed the franchise to create its own unique culture within the IPL. They will never be a juggernaut like the Chennai Super Kings but what they have become is the little engine that could.